In my theory Kiara and Kion were littermates. Kiara was the firstborn. However, at first, Kion was chosen to be the future King because he was a boy. And he was the cub shown in the end of first movie. Then the great Kings told Rafiki that Kion was chosen to be the leader of the Lion guard as Kiara was girl, what's more she was given a special mission. So, the other presentation was held and Kiara was chosen to be the future Queen. That cub, from the end of the 1st Lion King film, is a boy and Kiara's presentation is only at the beginning of the sequel. Here are links that explains the difference of the cubs from 'The Lion King'. Besides, someone on YouTube made a video that also explains the difference of the cubs. Anyway, I like the picture. Only reason the presentation and design are different now is because different animators and the fact they didn't want a Simba clone most likely, hence why Kiara isn't a exact clone. 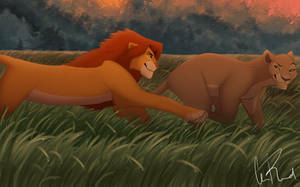 I know that most people consider the cub from the end of the first movie to be Kopa the cub from the book. But Disney still hasn't mentioned anything about him. I think they just came up with the idea of giving Simba and Nala a cub but didn't created a design for him/her at that time. Later they created Kiara. But originally it was going to be her, I guess. Officially Kiara is the firstborn (at lest if we talk about her and Kion) and that is said in the TLG series. In my theory the cub presented in the first movie is not Kiara as well and I've mentioned that. It's Kion. But still it's just my idea why the cubs look different not a canon version. Such a unique theory! I completely agree with you!! And this looks really adorable! Good job!